Vita Zemaitis of Chatham was born July 12, 1936, in Kaunas, Lithuania, the daughter of Dr. Joseph and Kazimiera Dailide Zubkus. She met Benedict R. Zemaitis while the two were both award-winning amateur Lithuanian-American youth athletes in Chicago, and the couple married in 1956. 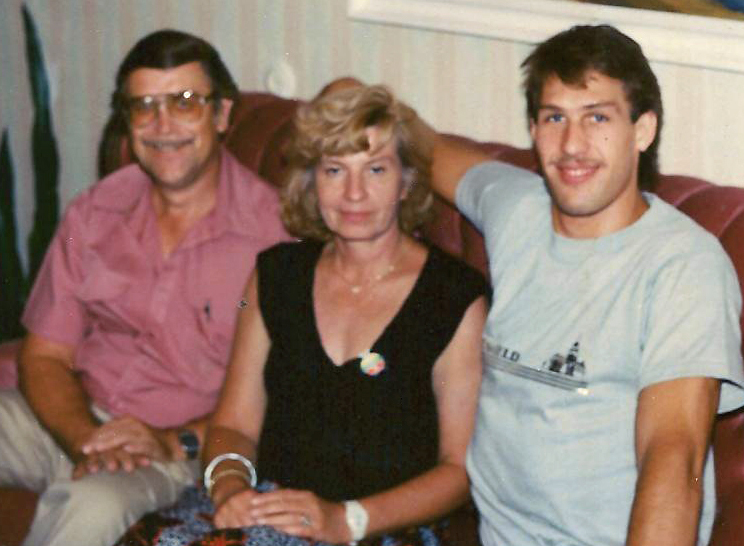 They had a son, Darius, who died in 1985. 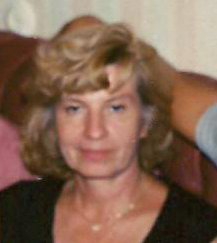 Vita attended the University of Illinois and De Paul University in Chicago and subsequently worked for nearly 20 years as an accountant and bookkeeper. She was a member of the U.S Tennis Association for a number of years and played in local and state tournaments. Vita was also a member of the American-Lithuanian Club of Springfield, serving as the organization’s treasurer for several terms. She also taught the Lithuanian language at Lincoln Land Community College. 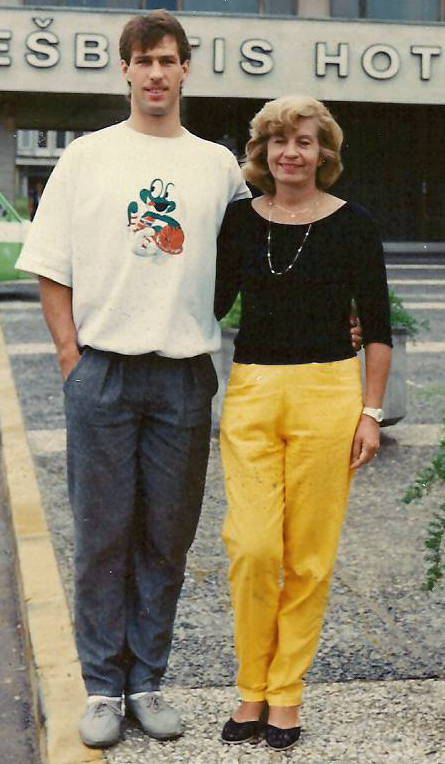 For a brief period starting in 1987, she met and assisted Soviet-occupied Lithuania’s Olympic basketball stars pictured on this page (while they were touring the U.S.). The Lithuanian contingent on the 1988 “Soviet” Olympic gold medal basketball team. Vita was an avid gardener and a wonderful cook and hostess. She also was a writer to the State Journal-Register newspaper, with at least 100 “Letters to Editor” published over the last twenty years of her life. She adored her three cats. Recalls start of war, journey to the U.S. The Nov. 11 article by Mark DePue about Kasimir Ladny and events from World War II brought back memories for me, also. Back when World War II started, it also started for me. There was this beautiful, large fragrant linden tree in full bloom in my mother’s country home in Lithuania. Right under the tree, I was the proud owner of a sandbox where barefoot, in shorts, I built my sand castles and talked to the chickens as they passed by. All of a sudden(in 1940), my mother came running, grabbed me in her arms and said there was shooting nearby. We were told by the German army to leave. There was no time to dress, no time to put on shoes. Our car had been confiscated; there was only an old wagon with a couple of old horses. She threw me in the wagon with a couple of blankets and off we went; my father and my brother also were surprised by our hurried departure. The Russians were being pushed back by Germans and there was fighting. Fall 1988, Lawrence, KS, fr. 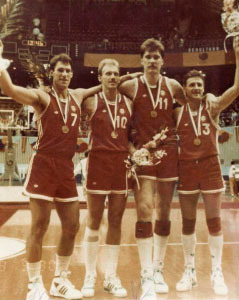 left – Arvydas Sabonis, Rimas Kurtinaitis, Sarunas Marciulionis, Vita Zemaitis. We crossed the border into Germany. I was still barefoot, wrapped in a blanket, and soon became very sick. My fever lasted for days, but my father was a doctor and managed to keep me alive. We rode through different villages and cities. Some cities were in smoldering ruins and I remember the stench of burning bodies. Allied bombing brought hope that this conflict would end and soon the Americans and British will be in control. 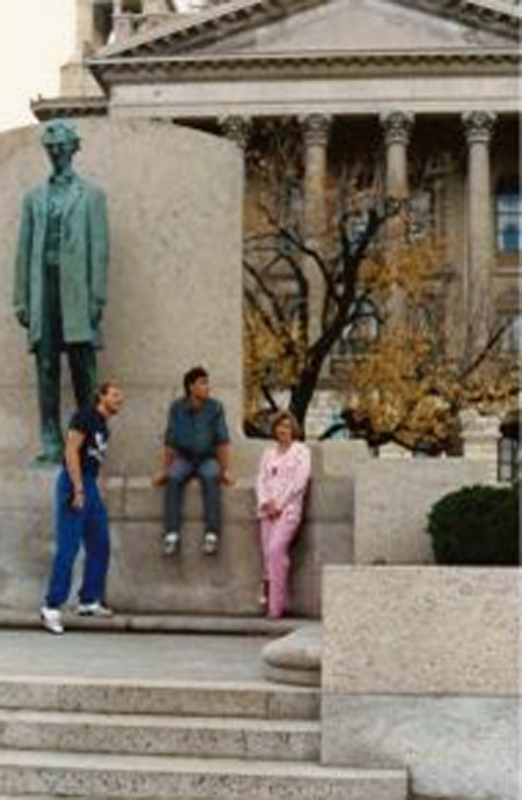 Fall 1988, Lawrence, KS, fr. 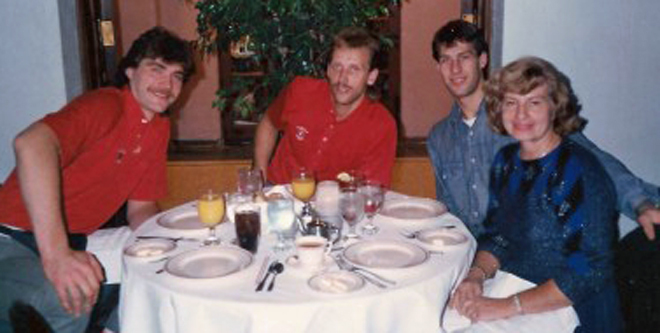 left – Rimas Kurtinaitis, Sarunas Marciulionis, Vita Zemaitis, Donny Nelson. Many refugees ended up in displaced persons camps administered by the UNRA and the Red Cross. We received boxes of food and other essentials (powdered milk, flour and sugar). We also received peanut butter. I thought that was the best thing I ever ate. Eventually, we were allowed to immigrate to USA. Vita is survived by her husband, Benedict; brother, Sigitas Zubkus and his family in Maryland and Maine; a few cousins in Lithuania; and a few nieces and nephews.